This restaurant is so perfectly suited to its neighborhood, it’s almost surprising it didn’t exist here already. The sleek, convivial modern Mex charmer is the product of two husband-and-wife duos: chef Brian Enyart and pastry chef Jennifer Jones Enyart, both veterans of the Rick Bayless empire, and Michael Rotolo and Erika Martinez Rotolo, who learned how to manage a restaurant from stints at Joe’s Seafood, Prime Steak & Stone Crab (Michael) and RPM Italian (Erika). In the kitchen, Enyart does fierce things with masa and mole (chestnut cornbread coated in a ruddy iteration of the complex sauce is a highlight), while Jones Enyart crafts memorable desserts, such as a voluptuous flan. No wonder there’s always a throng of Logan Square residents and wannabes jockeying for a booth. Brian Enyart spent the first 14 years of his career quietly climbing the ladder in Rick Bayless's kitchens, rising to chef de cuisine at Topolobampo—easily the most rarefied and progressive restaurant in the Bayless empire—before stepping away in 2011. 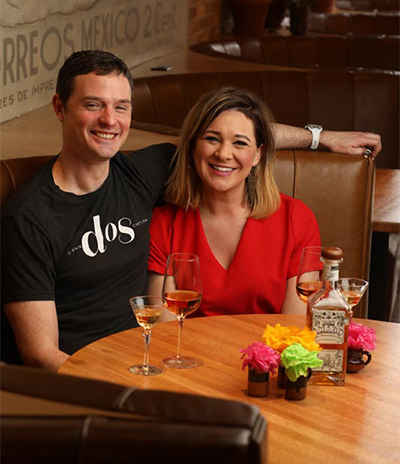 There were a few consulting gigs and a stint at a Saint Louis Mexican restaurant, but now he's back, along with former Topolobampo pastry chef (and wife) Jennifer Jones, at Logan Square's Dos Urban Cantina. Given the extraordinary number of restaurants in and around town that employ at least one of those three words, it's a bland name, one that undersells what's going on inside. Enyart and Jones are doing something similar to what Diana Dávila did during her regrettably short tenure at Andersonville's Cantina 1910. They're taking Mexican food to places it's never been before. The large two-room space, formerly Katakana Sushi Bar, seems similarly matched in size and ambition to the work being done in the kitchen. This is Mexican food at once familiar and new. There are no molten blankets of cheese, no searing chile burns, no baseline foundations of acidity. Instead Enyart goes deep, exploring bitter, thick moles and intense flavors while harnessing the fulsome power of nuts, legumes, and fungi. The current menu, whether intentional or not, is ideal for winter. Hearty, earthy flavors like grilled Japanese mushrooms and soft, toasty sweet chestnut corn bread are only amplified by a thin but intricate red mole. A quartet of taquitos bathing in tomato broth are stuffed with an intensely briny shrimp mousseline countered by the giardiniera-like hash of pickled vegetables they're topped with. From under slices of seared rare flap steak, swipes of inky black garlic, bagna cauda, and pasilla salsa, sweetened by raisins, add a deep funk reminiscent of dry-aged beef. Gamy, dense goat meatballs swim in a stygian black mole buoyed by airy masa gnudi. With these dishes Enyart brings Mexican food to the dark side. And yet he also has a knack for subtle mashups too seamless and complementary to be described with the F-word, or even to be put in ironic menu quotes. A trio of dips that accompany the housemade tortilla chips include a pumpkin-seed hummus rendered creamy by lime and roasted tomato. Worlds collide with long, gnarly chicharrones standing up in a thick French onion yogurt dip—a salute to soup mix. Buttery chunks of juicy chayote wallow in a peanut mole that recalls Chinese sesame noodles. A mound of black lentils is tossed with springy Israeli couscous, topped with a jiggly poached egg, and given a Mexican touch with the addition of a sparky jalapeño salsa. Enyart's boldest cross-cultural move is a plate of carnitas paired with Polish-style sauerkraut and mashed potatoes, set on a sour tomatillo broth—a tribute to the synergy of his eastern European upbringing and his long immersion in Mexican cuisine. There are some bursts of pure sunshine on the menu however: a gorgeous mosaic of raw scallops—bathing in spicy-sour lime aquachile, dotted with dollops of pureed, roasted sweet potato, and sprinkled with black chia seeds—looks like a supernova and is a taste explosion. Enyart's nod to the street snack esquites is a bed of smooth, cool masa pudding sprinkled with crunchy hominy and cotija cheese. A long fillet of smoked trout is pillowed by a pile of charred broccoli and cauliflower, seasoned in nutty peanut salsa macha with a long finger of sweet pureed butternut squash stretching alongside it. Jones comes in strong with a half-dozen desserts, from a relatively simple but rich dark chocolate cake to a vanilla flan textured with hazelnut and quince to a delicate tres leches cake piled with oozing jellylike coconut. A dark piloncillo sugar pie is made with unrefined cane sugar and suspended nuggets of pecan toffee that make it an early favorite for top dessert of 2016. Cocktails generally skew slightly toward Mexico, including an eye-opening margarita made with sour orange, an intensely grapefruit-forward Paloma, and a manhattan made with the floral anise-and-fermented-honey-based Yucatan liquor xtabentún. Wines come from all over the map though the list is dominated by midpriced bottles from California, France, Italy, and Spain, while local beers make a strong showing, with the three taps occupied by hometown breweries and quite a few represented among the nearly two dozen bottles and cans. Were it not for the recent shakeup at Cantina 1910, I'd be more tempted to say that 2016 might be the year Chicago chefs take Mexican food someplace radically new. If that's true, Dos Urban Cantina is ground zero. 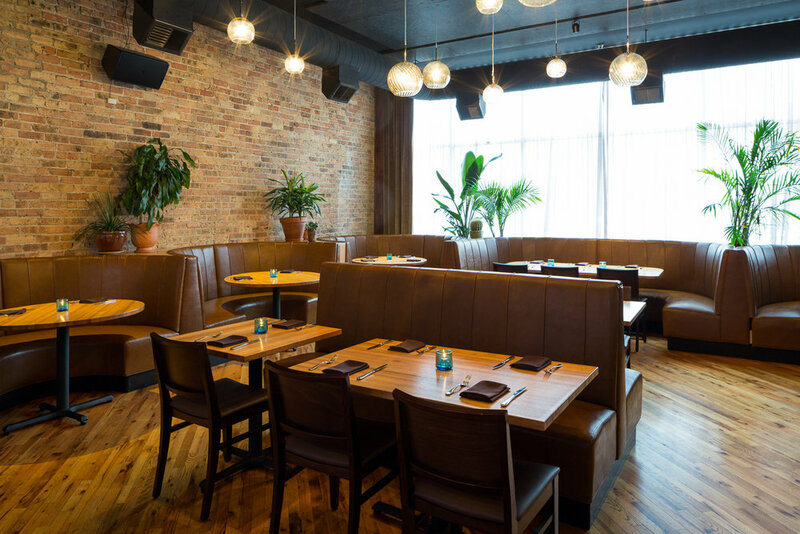 Dos Urban Cantina is the most important Mexican restaurant to open in Chicago since Topolobampo. Which, not coincidentally, is where chef/owners Brian Enyart and Jennifer Jones worked, prior to striking out on their own in Logan Square. This rave review comes without the element of surprise. A few days ago, I unveiled Phil's 50, a list of restaurants currently curling my toes. Dos Urban Cantina, which has been open for all of three months, clocked in at No. 30. So everybody already knows I like this place. But we're here now, so I might as well explain why. The background is solid. Enyart worked at Frontera Grill and Topolobampo for 14 years and had been chef de cuisine before departing; Jones was Topolo's pastry chef. Their partners, Michael Rotolo and Erika Martinez Rotolo, are Lettuce Entertain You veterans. The space is pretty, divided into a 30-seat front room with a bar and open kitchen, and a 70-seat main room with free-standing tables and comfortable half-circle booths. Natural materials dominate (brick and oak particularly), there has been some effort made at sound dampening (not entirely successful on packed weekend nights), and there's a laid-back vibe that doesn't compromise the service staff's professionalism. The cooking, Enyart and Jones say, is Mexican inspired, and the menu is a very personal expression of Mexican flavors. There are echoes of the American South, Asia and Eastern Europe here and there, and they only add to the appeal. The menu is divided into quadrants — Vegetables, Masa, Seafood and Meat — and there are stars in every corner. Among the veggies, for instance, are grilled maitake and shimeji mushrooms in a Oaxacan red mole and a slab of chestnut cornbread. Chayote gets a rare starring role amidst avocado and serrano, above a peanut mole so subtle, one needs to linger over it to appreciate it fully. Black lentils with couscous, deep-green watercress and a translucent poached egg offer unexpected depth and richness, but a bright jolt of jalepeno salsa keeps it from becoming overwhelming. Seafood dishes are irresistible. Octopus pieces swim in an impenetrably dark squid-ink sauce, alongside a bright-white pile of rice. Raw scallops arrive as a virtual mosaic, picking up color and texture from pink pickled onions, cilantro leaves, chia seeds and dabs of sweet-potato puree. Sweet pieces of sea urchin sit over a dice of tomatillo and green apple, with a little chicharron-steeped cream underneath. And whenever the evening's specials include raw salmon belly, piled high over guacamole with avocado, radish matchsticks and hints of soy, citrus, serrano and smoked olive oil, grab it. Better still, order two. Shrimp and sea bass ceviche lurk in the Masa section, only because of the tostada underneath. This section also includes yummy little shrimp taquitos with pickled vegetables, and a corn tamal, served out of its husk with charred Parmesan, a sweet and earthy dish. Best is the "street style corn," a mix of sweet niblets, hominy and masa pudding, along with the typical street-food accompaniments of cotija cheese, mayo and chili. Not only is it delicious, it also embraces three representations of corn, each a bedrock of Mexican cooking; it's a very thoughtful dish. Enyart seems at his most playful in the Meat quadrant, switching up his proteins to create a beef pibil (rather than pork) with black beans, habanero salsa and an ode-to-the-South helping of collard greens. Albondigas (meatballs) are made with goat meat, served in black mole with like-size balls of masa gnudi, a tasty and more tender version of the classic ricotta dumplings. Vivid-red slices of beef bavette stand out from an inky pasilla salsa and bagna cauda, both adding elements of funky flavor. Carnitas come with Polish-style sauerkraut (heavy on the caraway) and buttered potatoes; were it not for the bright tomatillo broth underneath, this could have come from my wife's Alsatian-grandmother's kitchen. The first time I visited, the dessert menu listed the chocolate cake as "the best ever." These days, it's called "chocolate cake on a fancy plate," a nod to the vintage dishes on which the dessert is served. But it's still a black hole of deliciousness, from which hunger cannot escape. There are other desserts, of course. Flan picks up textural variations from pieces of crunchy shortbread, whole hazelnuts and thick pieces of quince. Piloncillo sugar pie with malted whipped cream and pecan toffee is nicely complex, while gooey coconut and upright shards of meringue add drama to tres leches cake. Attentive, personal service turns the menu explanations into pleasant conversation. The budget-sensitive wine list offers lots of options, and cocktails are especially good. I expected a couple of Topolo vets to offer a superior margarita, and they do, but the "Dos Manhattan" and the scorched-lemon "Charred Canary" were revelations. Well done.